Two days is way too short to appreciate the beauty (and creature comforts) of Hale Manna in Moalboal, Cebu. The huge rooms and wide open garden that opens up to the sea will have to give way to two days of bunking on the liveaboard of Harold Dive Center. Sort of two days since I get to stay overnight on a reef station, but that's getting ahead of the story. We make an excursion southwest across Tañon strait to Bindoy in Negros Oriental (located less than 2 hours drive from Dumaguete City) to meet, talk and share lunch with Mayor Valente Yap. 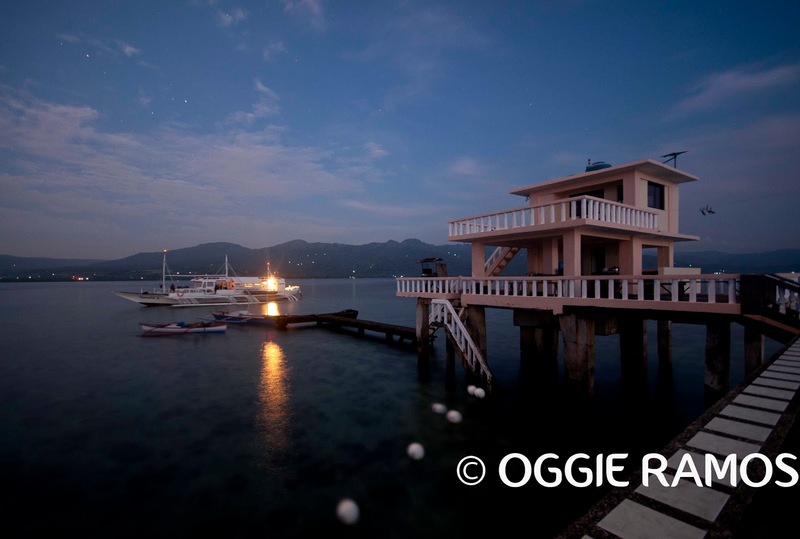 The shallow water near the mangrove areas meant we have to ride a rubber raft from the liveaboard heading to what Yas aptly calls the Mangrove Pavilion. 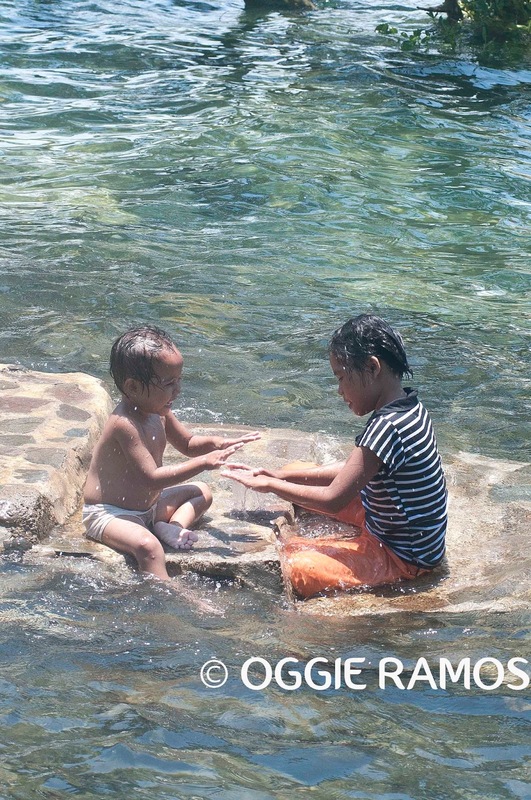 It was a hot day and the locals certainly didn't want to waste another minute in the sweltering heat, not when the clear, cool waters under the mangroves were too inviting for a swim. What's immediately apparent is the lushness of the mangroves lining the bank and the clarity of the water. Young boys took turns testing the strength of tree branches as they climb up and splash into the waters over and over again. Kids and toddlers dip in the shallows as their adults swim and pose for selfies/groupies, unmindful of us visitors. After a nice lunch, we hunkered down for a tete-a-tete with Mayor Yap who shared his insights on how preserving the mangroves and keeping the periphery free from large-scale fishing have brought back the fish catch volume in recent years. 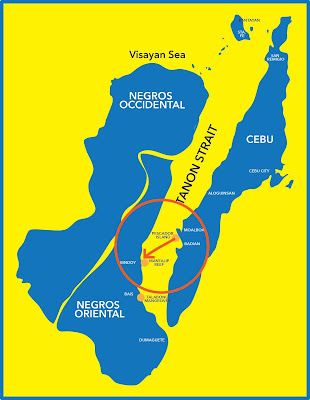 As Negros' lone municipality, Bindoy has an interesting mountain to mangrove to sea grass preservation program, a clear cut demonstration of the interdependence of the different terrestrial environments. I have a special spot for environmental conservation and it was immediately sensible to me why preserving the mountains help prevent heavy siltation and run-off that can harm the sea waters below (hence the reference to sea grasses). The mangroves are natural windbreakers that also provide a habitat for fishes, especially the young fry which would otherwise be easy prey to predators. The place has seen incremental increase in fish catch over the past few years as slowly, the locals have caught on in the program. We later visited another mangrove sanctuary farther out along the coast before heading to the reef station in Mantalip. By sunset, the waters have receded, exposing the rocks and necessitating transfer by kayak to the guard station that sits on stilts in the middle of the sea. When I first saw this item on our itinerary, I was expecting a claustrophobic hut in the middle of nowhere. To my (our) surprise, we instead saw a concrete structure complete with sleeping accommodations and t&b for guests. 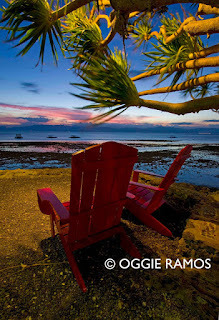 It was a novel experience for me as it was a rather sublime experience to find myself spending the night literally above the reef, listening to the crashing of the waves as I eat, shoot and sleep. On our 6th day, we sailed the whole morning and part of the afternoon to Bais to rendezvous with the dolphins. Harold's liveaboard was a beehive of activities -- the crew prepping equipment and food, us participants hanging around either on the bunks below deck, the seats outside, or the main hall where the food and coffee are served. It was a crazy afternoon for me as having only one camera body, I have to switch from a telephoto to ultrawide lens as we would alternately spot the spinner and bottle-nose dolphins from a distance and right beside and under our boat. I was not so sure of getting a keeper for this day as the other boats would cut into the path of the dolphins and drive them away (goes to show that boat operators have a long way to go in training their staff on how not to approach these gentle creatures). By mid-afternoon, the other boats have made their way back to land. We (I?) lucked out in this one last sweep as we saw waves after waves of dolphins, so much so that we forgot protocol and took our positions on the boat prow sans life vests, clicking away. 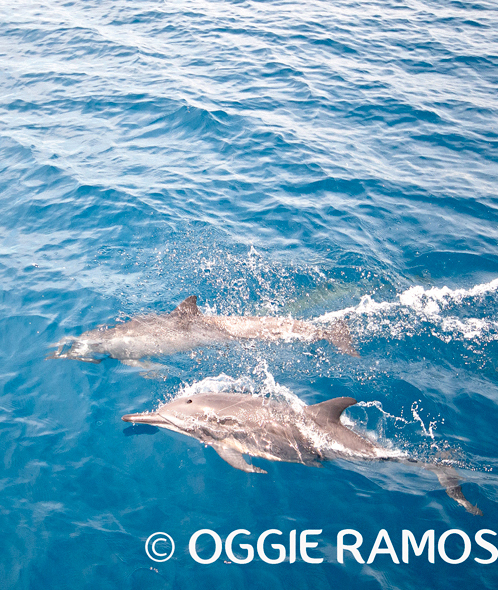 We sailed home to Dumaguete with smiles on our faces (I guess spotting dolphins can do that). Notes: This post is 5th in a series of features for our 6-day photo safari along Tañon Strait for Oceana Philippines. Oceana is dedicated to helping protect and restore the world's oceans on a global scale. In the Philippines, the local office of Oceana is seeking to restore the health, richness, and abundance of our local oceans by ensuring sustainable fisheries and vibrant marine ecosystems. Special thanks go to Harold Biglete of Harold's Dive Center. If you happen to find yourself in Dumaguete, check out his place, Harold's Mansion located along Hibbard Street just minutes away from the boulevard. Harold, himself a PADI-certified instructor, has two liveaboards available for guests who would want to dive in the area.